While I played with HSV pie and color wheel before, usually I just use the excellent Qt graphics stack to try out various things. This days, I lean towards using web technologies and for that purpose, HTML Canvas suits me just fine. With PhantomJS, I even got the result rendered as PNG image. Beside the above example, there are few other things which you'll get in the upcoming PhantomJS 1.1 release, among others support for Unix shebang, file upload for form submission, disable/enable images loading and plugins, as well as support for QUnit integration. 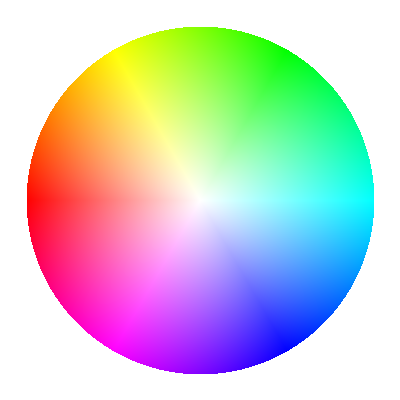 It should be much faster to render it using a six-range conical gradient overlayed by a radial gradient with a white center point.